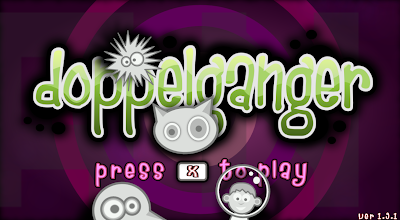 Doppleganger has recently been released on PC, five years after making its debut on Xbox Live Indie Games and six years after we first previewed the game back in RGCD issue #03. Originating from a simpler time before the current day indie-scene explosion, the game is essentially a mash-up of Jeff Minter's Iridis Alpha and the coin-op classic Defender - and as that would suggest, it's a ton of classic retro-style twitchy-shmup fun. 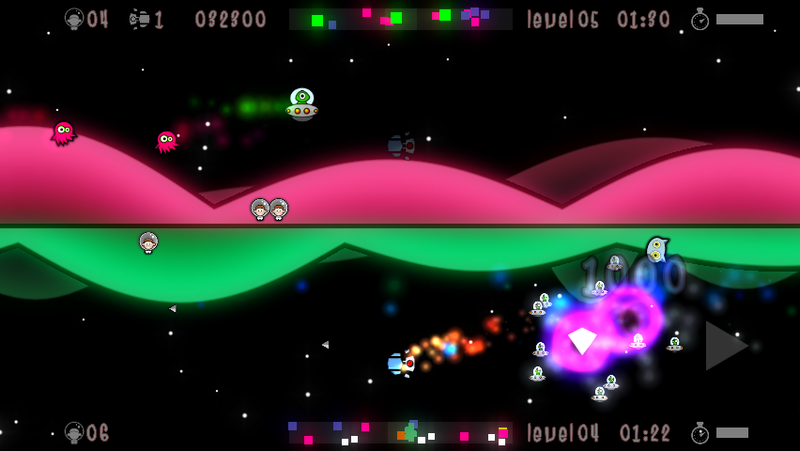 Also, in contrast to the XBLIG release the pc version is completely free - which is always a good thing. For those of you unfamiliar with Idris Alpha and Defender, the game takes place across a side-scrolling split screen with the player controlling a ship in each, one which is 'active' and the other being a 'ghost'. Your aim is to fly across the landscape, switching between the two states and protecting the astronauts stranded on the land below from marauding aliens, lasting for as long as possible to build up your score. Paul Cunningham of Pumpkin Games describes the code for his game as "very bad", with "programmery" graphics and "meh" sound effects. Nonetheless he is understandably passionate about the game that he loves. The description of the game probably deserves to be a bit more middling on presentation and gameplay than Paul's comments above. The glowy graphics and suitably spacey sound are both perfectly acceptable given the quick and easy arcade gameplay - although truth be told, here at RGCD we actually preferred the low resolution pixelled graphics of the original preview version over the clean-cut final. Doppleganger is a classic example of a game that does nothing wrong per se, but also provides little to appeal to gamers who aren't already fans of the genre. It may be the case that the game is aimed more to long-time fans of Defender and Iridis Alpha but gamers not steeped in the arcade lore of shoot-em-ups may find Doppleganger too simplistic - even archaic - to get a lot of enjoyment out of it. 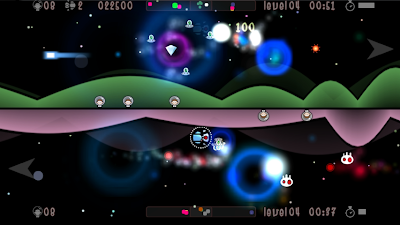 To combat this there are two self-explanatory game modes, in essence a score attack and a time attack mode as well as a local two player mode that I wasn't able to test due to a lack of local friends (*sob*). 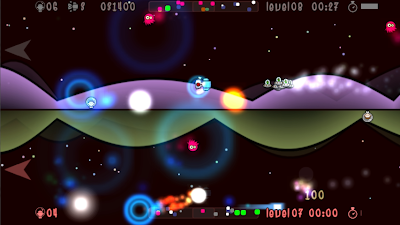 The game modes both play the same just with a different aim - a big score or a quick time. How much enjoyment you get out of it will come down to how much time and effort you are willing to put in. The nature of this type of arcade game means that the learning curve is often steeper than you may expect, particularly with the dual screen aspect. As you whiz across the landscape looking for aliens to blow up it's easy to flick between screens too fast and crash straight into an enemy. 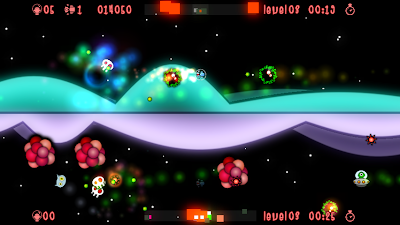 Gameplay becomes even faster as you progress through the levels, with more and more aliens coming to abduct your astronauts and transforming then into death-laser-spewing mutants. Navigating between the upper and lower sections takes the already challenging Defender based design and ups the ante considerably, making practice and perseverance essential to master the game. Whether you have the patience for that will depend on how much you enjoy the genre. Doppleganger's unique selling point is in being almost a straight-ahead mash-up of Defender and Iridis Alpha, so it goes without saying that if you have fond memories of either/or both of these games then you'll probably find a lot to enjoy. If that sentence means nothing to you then Doppleganger might not be your thing - however, as a free download it's certainly worth a look.